I ordered the USA! USA! Top Coat and was so excited that it arrived in time for me to do an Olympics mani. 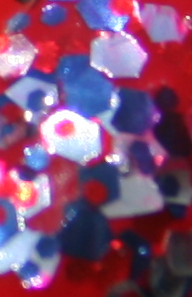 I chose a red polish for my base shade, but if I was doing it over, I think I'd do a white base so the red glitter would be more visible. 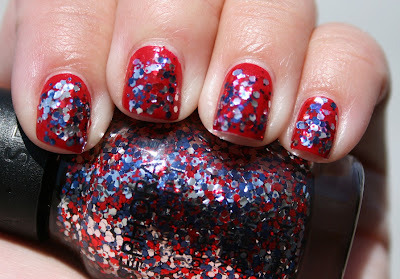 I did have some application trouble with this glitter topper..... the other glitter toppers I've tried from Sephora by OPI were great and applied easily. USA! USA! was very thick and would not stay put as I did multiple strokes to cover my nails- each stroke would remove more glitter. I ended up dabbing it on but still had trouble getting it back by my cuticles. Since it was so bumpy, I topped it with two coats of Gelous before I did my topcoat of NYC Grand Central Station, and surprisingly, that leveled it out well.